Taking a camel safari in Jaisalmer is an unforgettable experience. Riding out into India's Thar Desert then sleeping under the stars peels back the centuries to an adventurous time. 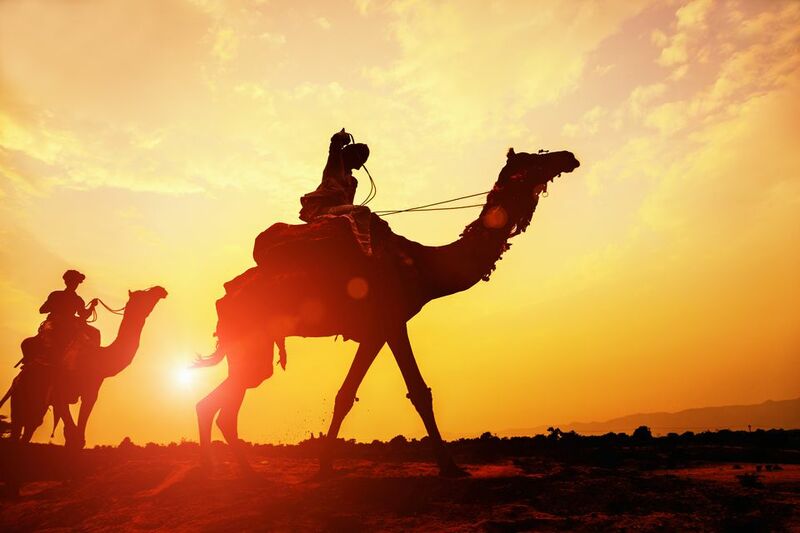 Trader caravans and sword-wielding raiders once rode camels over the same dunes toward the same desert forts. Needless to say, going into the desert with complete strangers can present numerous challenges — plus a bit of anxiety. Booking your safari with a trustworthy, reputable company is essential. Begin by asking other travelers — many are also doing camel safaris in Jaisalmer — for up-to-date recommendations rather than relying completely on what you see online. The safari staff often move from one company to another, and reviews get "tweaked up" by friends and family. Although pretty much every hotel or business in town will happily book a camel safari for a commission, it's big business in Jaisalmer, staying in a nice hotel does not ensure a nice experience in the desert. Upscale hotels are known to book cheap excursions then keep the difference as commission. Ignore all the touts on the street who are trying to sell desert adventures. The safest option is to walk into a tour company office, meet the staff, then decide if you want to book with them. Tip: Don't believe the photos you are shown in the safari booking office; you'll see the exact same stock photos used again and again in other shops! Competition is fierce in Jaisalmer; don't settle for muddled answers or cave into sales pressure. The typical camel safari in Jaisalmer lasts for two days with one night in the desert, however, trips up to 30 days are available! Technically, you'll be riding dromedaries, also called "Arabian camels," with only a single, large hump. Don't worry, even the guides still refer to them as "camels" rather than dromedaries. The desert in Rajasthan is different than the Sahara Desert. Don't expect to start out in a desolate landscape with nothing but sand as far as the eyes can see! Even safaris that use a jeep to get deeper into the desert will still encounter communication towers and such. Rest assured: the Thar Desert is very much a "real" desert — all 120,000 square miles of it. The landscape is arid with scrubby vegetation — what the camels feed on. Most safaris take a meandering path through arid grasslands and past small villages where people may wave hello. You'll typically only spend a couple of hours on the camel at a time before stopping for long food breaks. Although this sounds like a short amount of time, most people's backsides can't take any longer in the saddle! Even experienced equestrians are inevitably sore the next day from the dromedary's exaggerated movements. Tip: Hold on tight when your camel is kneeling or standing; the motion can jolt you out of the saddle! Because you can only spend so much time on the camels, food and education about the desert way of life are given a lot of emphasis. The guides skillfully prepare fresh vegetable curries and made-from-scratch chapati breads from raw ingredients over a small fire in the desert. Let your cooks know if you prefer spicy or not spicy. Some of the curries may be a little spicy by default. Good safaris usually provide more than enough food. You may wish to bring hand sanitizer; most of the foods are eaten with the hands. Desert safaris stop at a strip of sand dunes that hide nearby settlements, providing lots of photogenic landscapes for customers with romantic notions of the "real desert." Hordes of wandering dung beetles live in the dunes. Although they aren't aggressive, they are a nuisance and may give your bare bare feet an exploratory pinch. Depending on the size, your safari may be consolidated with other groups to camp in the dunes. The camps are often resupplied by jeep; some companies offer free cold beer and soft drinks on a first-come-first-served basis. The desert is coldest just before dawn; temperatures are very chilly at night. You'll be sleeping in cots to get off the ground. Large, heavy blankets will be provided. If possible, opt to sleep outside — spending a night in the open under a sky of shooting stars is truly unforgettable! At night, you'll be engulfed in complete darkness. To avoid attracting insects, only a small cooking fire is built a distance from the camp. You'll definitely need a reliable flashlight. Walk far from camp for toilet runs. As your camel plods along, take an opportunity to learn about the way of life in the desert; your guide will gladly oblige. If your group is small, you may be asked to help pull water from the well for your camels, or even to chop vegetables for lunch. Seize the chance to participate and learn a little about the camels and life in Rajasthan. As you can guess, going into the desert on a camel means being completely exposed to the sun with no cover. At night, temperatures drop enough to make everyone shiver. Dress for both extremes, and cover as much exposed skin as possible. Don't just rely on sunscreen; cover exposed skin with material. Women will want a shawl to cover themselves during encounters with villagers. A hat or wrap to protect your head is essential. Sun reflects off of the sand; sunglasses should have good UV protection. Unexpected rain is a possibility during the wet summer months (July and August), even in the desert. Have a way to waterproof your camera and valuables. Insects can be a problem at night. Sahara Travels (http://www.saharatravelsjaisalmer.com) near Gate 1 of Jaisalmer Fort is one of the longest operating safari companies in town. You may find cheaper safari trips around town, however, it's worth the extra difference to book with a reputable company. Unfortunately, Mr. Desert — their charismatic local celebrity — lost his battle with cancer in 2012. Assuming you've had a good experience and the tour was delivered as promised, it's customary to tip your guides at the end of the camel safari. There are no set guidelines for tipping, but many people choose to give between Rs. 200 to Rs. 500, depending on the length of the trip and number of staff. Competition between guides for employment is tough. They are rewarded with more tourist treks based upon guest feedback. If you really enjoyed your experience, say so when back in the office. Complement your guides by name in the logbook. Unfortunately, even some of the larger safari operations have poor practices such as leaving rubbish in the desert. Buried trash gets quickly uncovered as dunes shift. Don't be afraid to say something, and set an example by collecting your trash to pack out. Once stopped for the night, keep an eye on your belongings; temporary workers and friends of the staff may come and go. Giving pens and candy to village children just encourages them to beg from tourists. Avoid setting bad trends by giving handouts to beggars.